In my prior experience as a Mac Makeup Artist, there are few foundations that cause such a ruckus as Studio Fix Fluid ($30). Mac Haters would say that it was heavy and broke people out, and it probably did. It's also likely that they were using the product the wrong way. Don't get me wrong, Studio Fix Fluid isn't for everyone, and it's not even my go-to foundation anymore, but that doesn't mean it's lost it's special place in my heart! So let's run down the potential problems that some may encounter when using this foundation. SFF (Studio Fix Fluid) is a medium buildable, "natural matte" foundation. It is VERY powerful right out of the gate and therefore it's an easy product to go overboard with. "Too Much Of A Good Thing" is the overarching tagline of this product. 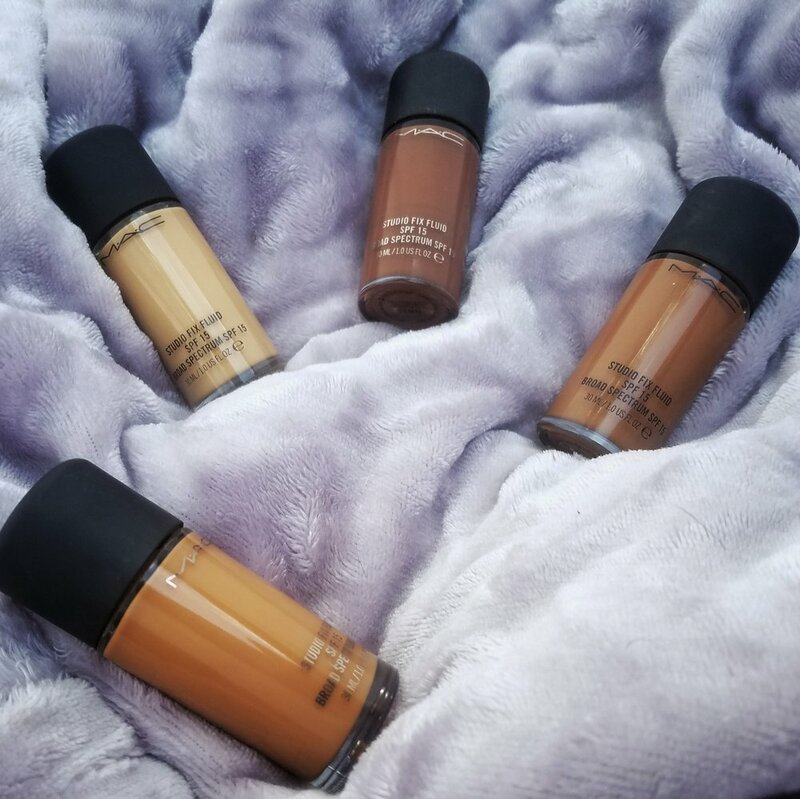 Whenever I start with this foundation, I start with at most a quarter-sized amount of product and make sure I blend out everything before deciding on whether or not I need more. This allows me to maintain my awareness of my product usage and also let's me gauge how intense I want the coverage to be. I prefer my complexion work to stay on the natural side so I don't mind the occassional minor imperfection slipping through. With that being the case I rarely use a heavy amount of product unless requested. Another factor that comes into play with "cakeyness" is the usage of powder products. Most people have a habit of piling on oil-controlling products on their skin without taking into consideration how these products work and their effect on the skin. A popular combo that I see used with Studio Fix Fluid is Studio Fix Powder, which is a FULL coverage powder foundation/setting powder. Notice how I said it could be a setting powder or foundation? That's how heavy the coverage is. It also has oil controlling properties, it's also a very popular combo with Studio Fix Fluid. This combo is a recipe for Cake Face, and let me tell you why. Whenever your skin notices a lack of moisture, it releases an excess amountof oil, known as sebum, to retain any moisture left on the skin. The problem is that sebum naturally breaks down makeup, no matter what. It's one of the laws of the existence. Grass is green. The Sky is blue. Sebum breaks down makeup. If you're using an excessive amount of oil controlling products, your skin is going to over react and create an excessive amount of sebum and you're makeup will slide off your face within a couple hours. So if you're setting SFF with a setting powder, be very light handed with it. It doesn't take much to set foundation, especially matte foundations which dry down anyway by nature. Another aspect that should be taken into account is Skin Prep. Skin prep is the stage before general application that ensures that your skin is in the best shape possible for receiving makeup. This process is all up to the individual as everyone has their own goals when it comes to the appearance of skin. With that being said, SFF is benefited greatly making sure the skin is properly hydrated. A moisturize should be a part of your skincare/prep routine, no exceptions. I'll rundown the skincare routine in a different post, but you always want to make sure that at bare minimum you skin is clean and hydrated. Last thing to note is Primer. Now I'm personally not a big fan of primer, but hold no ill will towards those who use them. My only issue with primer is that it further complicates the application process. Why? Because in order to be effective, a primer and foundation need to have the same base or else the foundation will start to seperate. In other words, a silicone based primer will need a silicone based foundation, and water based primer will need a water based foundation. Not only that, but often times it's kind of difficult to figure out what the base of a foundation or primer is, simply based off of the ingredients list. So rather than worry about it, I often elect to skip primer all together. Foundation managed to last on the skin waaaay before primer was a thing, I'm sure we can manage the same in 2018. So let's wrap this up with a quick rundown. If you want a more effective experience with Studio Fix Fluid, try starting with these tips. • Always start a makeup application with clean, and properly hydrated skin. No matter your skin type. • If you elect to use a primer, make sure it is a silicone-based primer to ensure product compatibility. Mac Prep and Prime Skin Base ($31) is a good reliable option. Also, a little goes a long way with primer, dollop about half the size of a pea should be just fine. • Start out with as a quarter-sized amount of foundation and blend it out completely before deciding if you need more coverage. And if you do, simply spot conceal rather than adding more to your face overall. Less is more and it'll lessen the likelihood of breaking out. • When using a setting powder, light layers of a finely milled powder are your best option. My favorites are RCMA No Color Powder ($12), MUFE HD Microfinishing Loose Powder ($36) and Mac Cosmetics Prep and Prime Transparent Finishing Powder ($29). I know I only addressed a small handful of topics when it comes to this particular foundation, so if you have any other lingering questions, feel free to reach out to me at perrynmorrismakeup@gmail.com!